SEDER is a recurring meal-based initiative committed to creating a path for rethinking how contemporary Jewish art and culture are financed and experienced communally. We host several community meals a year and all funds raised in exchange for food become a micro grant. During the meal, the micro grant is awarded to an artist selected by the diners. Thus, by coming to a SEDER event for a small cash donation, you get to become an arts patron and fund a new work of Jewish art. In exchange for a modest cash donation of $18, guests enjoy a vegetarian dinner and receive a ballot. Artists who've submitted projects make brief presentations and guests vote on the project they like the best. The artist whose proposal receives the most votes gets the donation money collected at the door. Each suggested project must involve the Los Angeles Jewish community in some way, and awarded funds will help the artist create new works of contemporary culture. 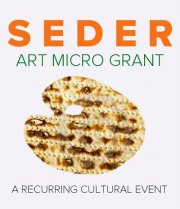 Since launching in February 2011, the SEDER Arts Micro-Grant has awarded over $3,000 in funds to four regional artists with plans for several large-scale events during 2012. Please visit our Facebook group and follow updates about our events.